Here are the formulas for creating Major and minor scales. 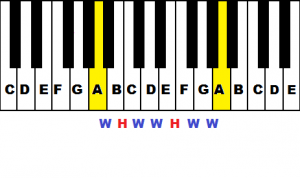 You can start on any pitch and follow these patterns and play either a Major or minor scale. 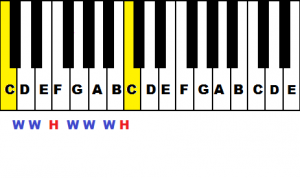 If you played all of the white keys you would play a C Major scale (C D E F G A B C). 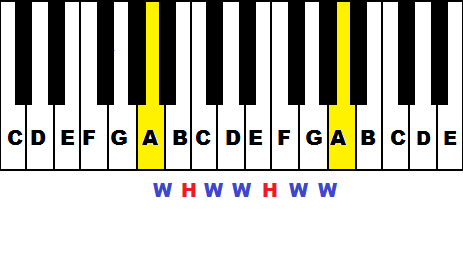 If we were to note the spacing of the pitches as either whole tones or half tones we would create the pattern below. W W H W W W H we just created to play a G Major scale. W W H W W W H we just created to play a D Major scale. 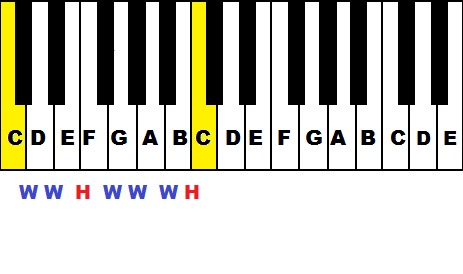 You can create a minor scale if you played all of the white keys. An A Minor scale (A B C D E F G A) would create the formula below.